SingleMomtism: Stir Fry Makes Dinner Easy - And This Handy Cheat Sheet Makes It Even Easier! Use your weekend time to do some grilling, baking and chopping. Grill or bake chicken breasts or pork chops (just grill if it's steak), then slice and bag in individual portions. Chop your veggies and put a variety in each bag. 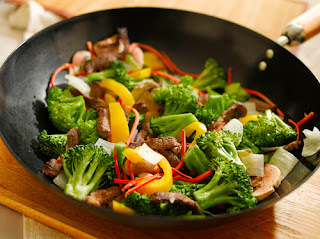 My go-to items are bell peppers, onions, broccoli, red cabbage and brussel sprouts. If your family likes varying sauces (like mine does), cook everything and serve the sauce on the side, letting each person drizzle as much or as little as they like on their food. Don't think you're limited to serving stir fry over rice or noodles - I put it on store-bought pizza shells, sprinkle a little cheese over and voila! Delicious, veggie-laden pizza! Try it in warm tortillas, as well - so good! And that, my friends, is how a busy woman makes a fast and yummy meal. Pass the soy sauce.